Need prayer help? want to research the history of our churches? Whatever it is, we’d love to hear from you. 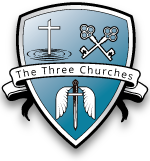 You can request for your child to be baptised in any of our three churches with this form. There is more information about baptisms here. Which church would you like to be married in? No matter what’s happening in your life prayer support really helps. Got a question? Always wondered what it’s all about? Ask away!